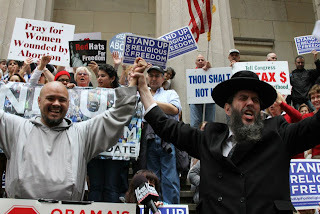 Romney Denounced by 850 + Rabbis | RabbiLevin.com - Fighting for Morality! At a special Chanukah conclave, The Rabbinical Alliance of America, a 70 year old organization of over 850 Orthodox Jewish Rabbis in the United States and Canada, serving approximately one half-million religious Jews, has condemned the decades long pro-homosexual record of former Governor Mitt Romney. Spokesman Rabbi Yehuda Levin declared that “Chanukah commemorates the defeat of the Syrian Greek efforts to impose their pagan culture on the Jewish people. The Jews rejected the intergenerational homosexual activity which was a prominent aspect of the Syrian Greek culture. While our organization does not make any endorsements of political candidates, in view of the disastrous national decline in morality, we are compelled to condemn Mitt Romney’s support and promotion of the immoral homosexual lifestyle and agenda. While we sympathize with those challenged by homosexual urges, or a desire for minors or adultery, they all remain prohibited activities that debase the practitioners and demoralize society. Governor Romney over a long political career has earned the title: ‘Dangerous Homosexualist’-one who constantly advances the militant anti-religious, anti-society, immoral homosexual agenda to the detriment of family people. A highly detailed exposé of Romney’s decade long proactive advancement of the homosexual agenda can be found in Amy Contrada’s book: “Mitt Romney’s Deception”. When Romney ran against Senator Ted Kennedy he wrote a letter pledging to outdo the ultra-liberal Senator in his fealty to advancing the homosexual agenda. Governor Romney also issued a proclamation “celebrating” gay youth pride. Romney kept his promise. If one has the same wife for decades and a beautiful family personally, but advances a corrupt ideology which runs counter to his own religion and destroys the religious cultural values of society, he is like a Rabbi who says; ‘I would never eat pork but I will force-feed pig to thousands of people.’ Pig remains not kosher and he too is not kosher. We plead with other religious denominations, most particularly the Mormon Church which maintains a traditional view regarding the homosexual agenda, to examine Romney’s record and join us in sanctioning him. The time has certainly come for other denominations to emulate the manifesto of the Central Rabbinical Congress of the U.S. and Canada which, in the early 80’s, prohibited voting for, honoring or supporting pro-homosexual agenda politicians. Like O'Bama, Romney will say and do whatever it takes to grab the presidency. Ohio - Undecided to even vote as a Republican! I am beginning to intensely dislike O'Bama for his appeal to those that don't get what he is up to....and cares nothing for anyone but himself. Many Christian denominations are compromising their beliefs for the sake of acceptance and popular approval. I must say that the Mormon Church cannot be counted on to maintain it's traditional stance toward the issue, given the fact that the Mormon Church is built on false teachings and apostate beliefs which contradict both Jewish and Christian orthodoxy. The Mormon Church has a long track record of using false "prophecies" to alter its beliefs and laws in order to placate public opinion. Such as its sudden reversal of its views about slavery and segregation. Do not be surprised to see them enter a "new phase" on this issue, if not publically, but through the complicity of silence. We should also bear in mind that this ultimately has a greater motive than just "civil rights" for some victim group. This is cultural Marxism at work, seeking to help advance any agenda of "useful idiots" which will serve to destroy the fabric of capitalist, Judeo-Christian culture in order to create the sort of chaos necessary for a revolution. What happened in the Eastern Bloc can certainly happen here, given enough time and complacency. "There are those today who not only tolerate but advocate voting to change laws that would legalize immorality, as if a vote would somehow alter the designs of God’s laws and nature. A law against nature would be impossible to enforce. For instance, what good would a vote against the law of gravity do? I would that Mr. Romney spoke this way. It's really sad that "moral" people who should know better willingly bear false witness of another moral person. For some of the ACTUAL FACTS regarding Romney's record, see http://whyromney.com and otherwise. Romney's supposed "support" of the homosexual agenda is being completely LIED about. So if Mitt Romney is being lied about concerning homosexual agenda, why do you give us a pro Romney address to confirm his "record"? How do you account for the president of the National Organization for Marriage vouching for his support and authenticity on fighting gay marriage? This is a conservative pro-family group in MA founded by a Jewish gentleman. Mitt the LYING TWIT won't ever get my vote! Mitt Romney is a big goverment Marxist/Hitler era Socialist! Romney isn't a conservative and never was. The GOP is not the party of conservatism anymore and they deserve to LOSE! I don't HATE anyone. I do hate evil! And Mitt Romney is an evil man.